The LuHi crew after their last training session before heading up to Glens Falls, NY to compete in the NY State Federation Class AA Championship Tournament. 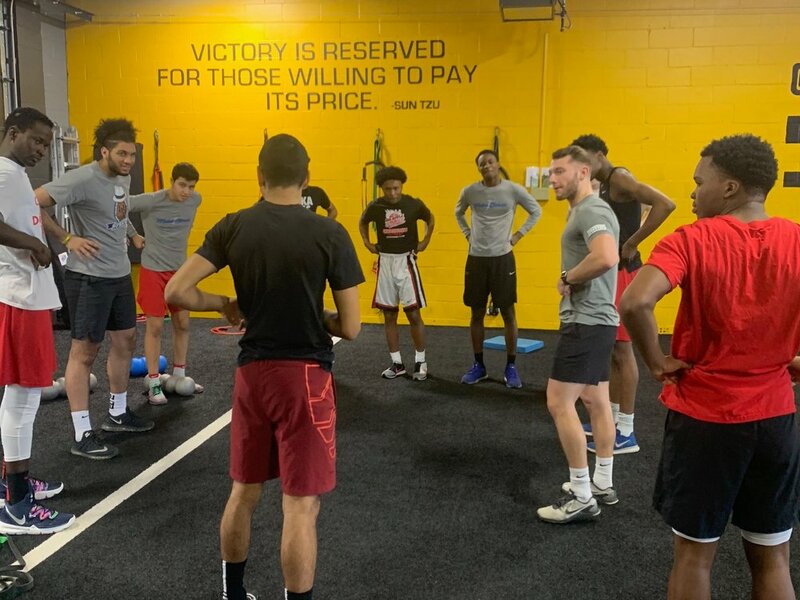 The past month has been quite the amazing ride for the AMP team with LuHi Basketball… We started working with them at the end of their regular season to prepare them for a state title that had been eluding them in recent years… and it all started with a conversation. Six weeks ago, I received a message from my friend John Buck. He was preparing LuHi Basketball for another run at the New York State Basketball AA Championship. He wanted to pick my brain a bit about getting his guys physically prepared for the tournament. Needless to say, I was both honored and excited that Coach Buck would even think to reach out to me and the AMP team to discuss such an important task. I had always admired Coach Buck’s leadership abilities and insight on building a positive culture. We had many early-morning discussions after our 6am AMPfit training sessions over the years on the topic. The challenge his team was facing was unique. While most New York teams have a regular playoff sequence to get to the state championship, Long Island Lutheran, an independent league team, has a full month off from their last regular season game until their first playoff game. While other teams are riding the momentum from beating their rivals throughout the month of March, LuHi has to replicate the environment and the physical aspect of these games with practice and scrimmages. It’s just not the same. We spoke about what we could do to ensure his team was physically and mentally ready for the moment. In years past, they would run into issues that presented as a lack in conditioning (more on this in a moment) and they also dealt with adversity that was out of their control. Last year’s semifinal game was struck with controversy where the official book was wrong, resulting in LuHi getting a technical foul when they called a late timeout. The official book mistakenly applied a timeout to LuHi instead of their opponent, which ultimately lost them the game. This was stuck in the back of everyone’s minds going into this year. The devastation of losing a game due to someone else’s error lasted well into the off-season for the coaching staff and players involved. They weren’t going to let that happen again. The goal was not just to survive these games… but DOMINATE. Sound familiar? We’ve got it painted on the wall at AMP. This year, LuHi was riding high into the playoffs, going 23-2 in the regular season and rising to the #8 team in the nation according to the USA Today poll. With players like Andre Curbelo, Essam Mostafa, Jayden Reid, Jared Reid, Drissa Traore, Tyer Stephenson-Moore, Yoro Sidebe, James Morakis, Zed Key, Paul Jordan, Jalen Celestine and Hugo Berstrom they were looking as good as they'd ever been in their illustrious school history. Yes, that’s the entire roster… they were the true definition of TEAM. Coach Buck and I spoke about the test ahead and what he thought they needed to improve upon this year. I believed the issues that looked like a lack of conditioning may have been more of a mental challenge rather than a physical one. When the chaos of the game, which will inevitably happen, presents itself, it’s what you focus on that drags your energy down. You will always fall back on your training and preparation; both physical and mental. We spoke about different fueling strategies, physical conditioning, strength, recovery strategies and the mental approach to the weekend. One of the major things we focused on was the simplest and most basic approach to recovery: breathing. 1- It resets your focus to something you can control. (You can not control the refs, you can’t quiet the crowd, and you cannot change the mistake that you just made.) When your focus switches from outward to inward, you will be much calmer and ready for the next play. 2- You receive the oxygen your body needs to function which allows you to relax and recover in between bouts of high intensity work. 3- Proper breathing mechanics will allow for more efficient function of your hips, shoulders and core while improving posture. In other words, when you start to stress out, you start breathing shorter and with your chest instead of with your diaphragm causing your heart rate to stay elevated and your brain function will be compromised. Coach Buck and I brainstormed, in an epic white board session, to outline the road ahead of us and the rest was history. At the top of the board was the ultimate goal: 25-2. A huge part of LuHi’s success is their culture. From the minute they walked in the door, they were committed to excellence. I don’t put those words lightly. Their first session left a lasting impression on myself and the rest of the team here at AMP. I have worked with countless teams and organizations from top travel organizations, high schools, colleges, professional teams and individual athletes and this one will forever leave in imprint on my mind as one of the most disciplined, respectful and cohesive groups I’ve ever worked with. The concept of “buy-in” is huge in coaching. If you do not have the respect of your team, they will not buy what you’re selling. This team was as "bought in" as I’d ever seen. And that has everything to do with the culture and leadership from the coaching staff and the captains. To say this team was special would be an understatement. We could have told them that bathing in peanut butter before the game would improve their explosiveness and they would have just done it. Ok, maybe not that! But, we did ask a lot from them. From showing up 3x/week to train and work on their strength and explosiveness, pushing them to the edge of their conditioning, to focusing on their nutrition and sleep, to doing this crazy looking warm-up where you rub, massage and scratch different parts of your body to improve posture, flexibility and efficiency. LuHi performing part of the RPR Wake Up Warm Up Drills with Coach Rob Beiter. But, of course, they didn’t… and the results showed! The whole team reported feeling better than they had all year in regards to their explosiveness, conditioning and energy. We dealt with some strains, bumps and bruises but all of them were 100% ready for the games. And that was our goal from day one. We managed their training, mobility, nutrition and hydration all the way from our gym in Syosset to the hotel hallways in Glens Falls, NY (Photos below). They were dialed in and primed for competition time. All of this hard work, consistency and buy-in to the process led to arguably the two most dominant performances this team had all year and anyone in the Federation Tournament had that weekend; winning by 24 and 20 points in the two games. They ended up holding the extremely talented, also nationally ranked, Christ the King team to only 31 points in the championship game. How’s that for a plan coming together?? Set a lofty goal: 25-2, Championship. Commit to the process to reach that goal: Training, nutrition, recovery, practice, visualization. Every day. Be Coachable: They were proactive in their learning. They asked questions, challenged themselves to think different. They were present and focused. Every day. Be Consistent: They aligned their words with action. They brought their best. EVERY DAY! Be a “WE", not “ME” culture: Everyone played their role. No one complained. And they all had fun doing it. I didn’t see an ounce of selfishness in this group. They were TOGETHER. I took a lot from this experience. As a business owner and leader of a team, I caught a glimpse of what the pinnacle of a winning culture looks like. It’s not always a tangible thing, but you know it when you see it. Coach Buck really built something special with this group... There’s that word again.. Special. That’s the way that many who’ve been around them would describe what they were. It takes a definitive set of core values and high standards to establish this type of environment. It doesn’t happen by accident. Coach Buck and his staff do a great job finding the right type of player that fits their culture. If you can learn anything from this story, it’s this. Every organization has the opportunity to build an amazing culture. Whether in business, sports or family. When you’re all on the same page, pushing in the same direction, supporting each other and present in every moment it’s something magical. I challenge you to be the change you want to see in your family, your business and your team. Step up and be the positive energy in all of your interactions. Be selective of those who you surround yourself with. If they don’t fit your core values as a person, they will only erode your positivity over time. Whether you’re a high school athlete looking to improve your performance on the field or someone looking to get more life from your years, these principles apply. Want to become a part of AMP’s winning culture?